Hey friends! So we’ve had some wooden outdoor furniture given to us over the years and since we live in the midwest they see A LOT of weather, which means they also get damaged from said weather. Any of you live out here with this harsh winters and humid, mucky summers? 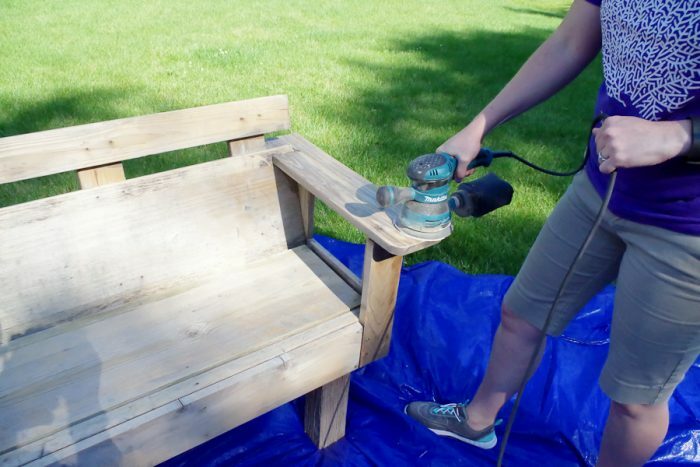 Needless to say, every so often we need to refinish outdoor furniture. 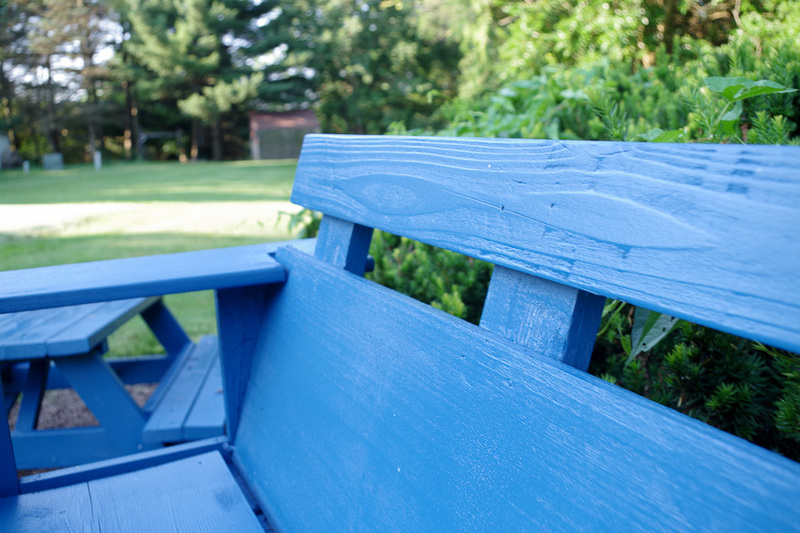 This particular bench was given to me and had just been coated in a stain and poly. I doubt the person that made it even put an exterior finish on it because it DID NOT last long at all. First, we power washed it. I forgot to take a photo of this because we did it at the same time we power washed our deck. I’m sure you can imagine just spraying every side of this with a power washer. It knocks off all the dirt and the weathered wood. 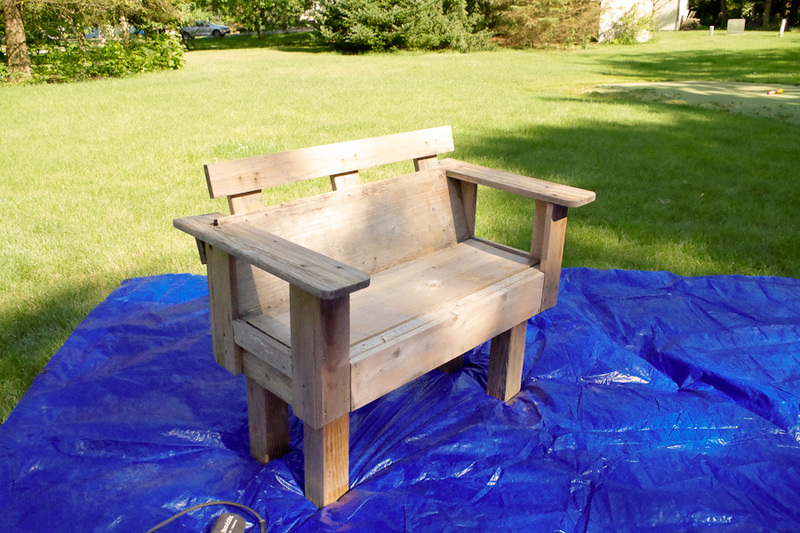 Next, I sanded it down. 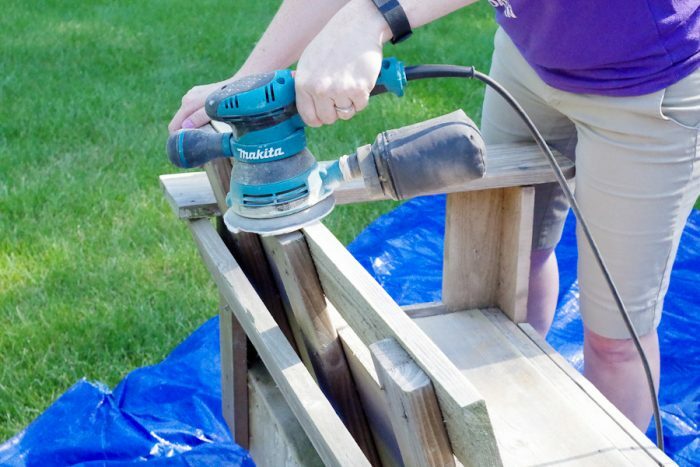 For an indoor project I probably would have done a more detailed sanding with my orbital sander then my corner sander, but since this is just for outside for my kids to sit on while playing in the backyard, I didn’t worry too much about all the crevices. After sanding, I wiped off the dust, then got ready to paint. 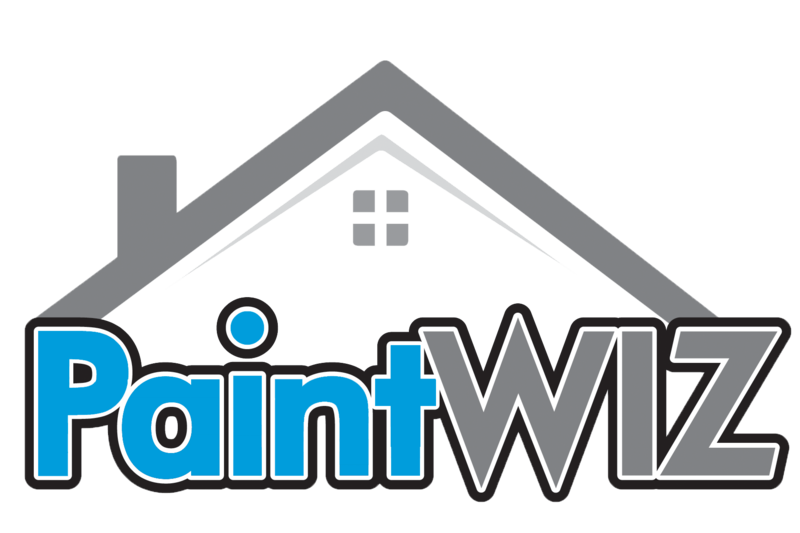 Painting this was an absolute breeze using the PaintWiz Turbine MAX Paint Sprayer . Definitely check this sprayer out if you’re the type of person who 1) hates brush painting, 2) hates cleaning up rollers and brushes and 3) loves simplicity and speed on home projects. I found it to be easy to set up and use. I found mixing the paint and using the viscosity cup that comes with the sprayer to make sure it was the right consistency pretty easy, though it took a little trial and error at first. The paint I used was an exterior satin latex, so it definitely needed some thinning. I just followed the steps in the pamphlet that came with the sprayer and found I did have to thin it a bit more than the paint can said I would, but this process was pretty easy. 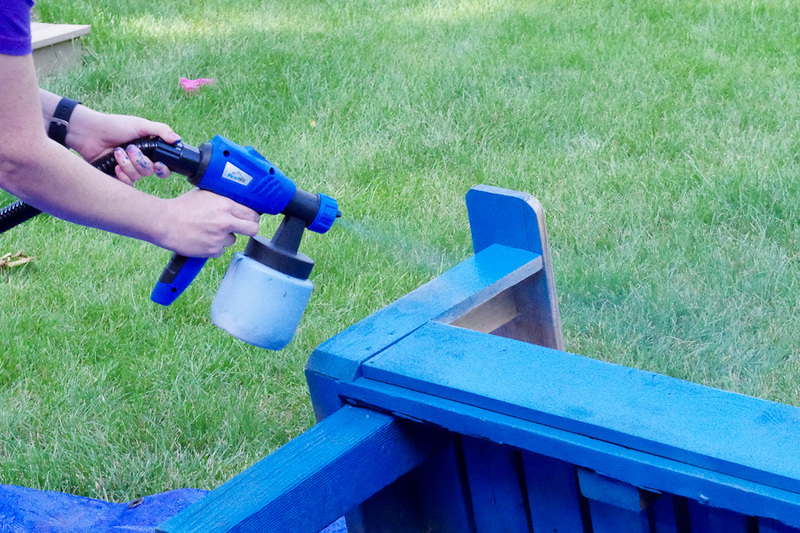 I just sprayed the paint onto the bench, being sure to hit all angles. 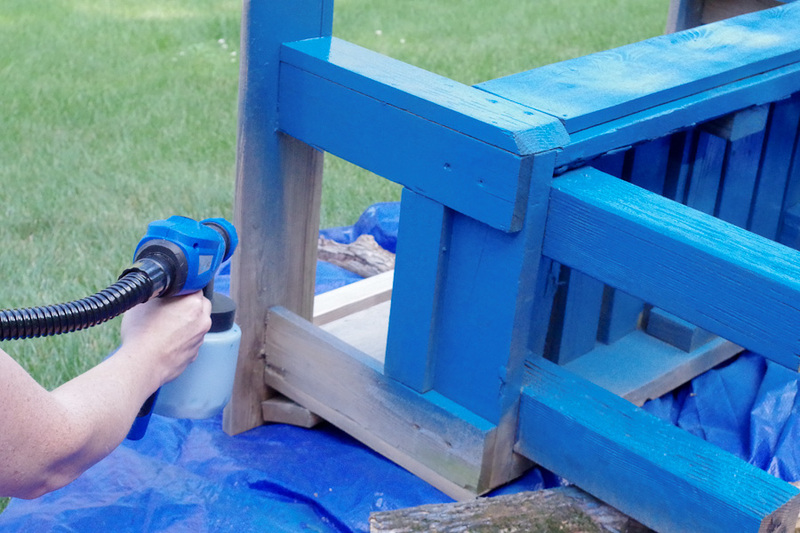 It was helpful that the sprayer had a setting to control how much paint flowed through. I love how FAST it is to use a sprayer and really appreciated that on this project. The first coat was done in maybe 10-15 minutes? Same with the second coat a few hours later. The greatest thing about this sprayer is that I don’t have a bunch of brushes or rollers to clean afterward. Yes, you definitely have to clean the sprayer parts as soon as you’re finished, but to me cleaning plastic parts is a thousand times easier than cleaning brushes and rollers, I swear I never get all that paint out of those! The Max sprayer makes cleanup easy because it breaks down to each component so you can be sure to get all the paint off. This sprayer will definitely come in handy! 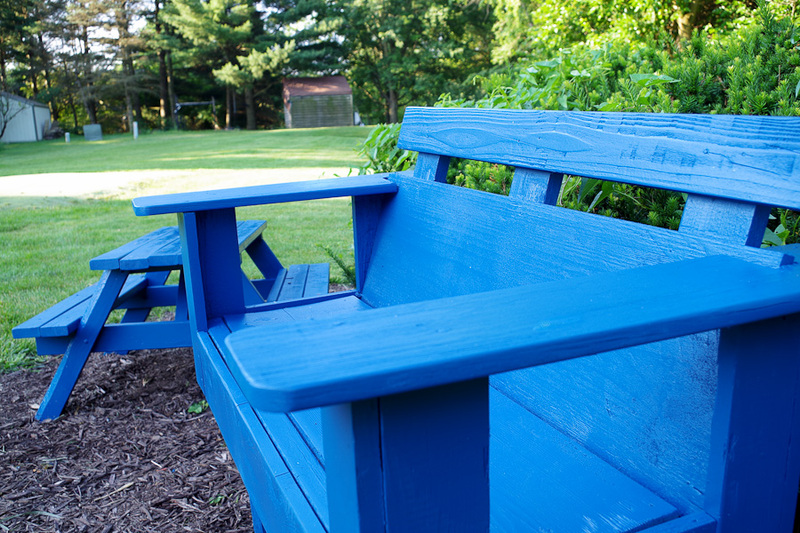 Project Refinish Outdoor Furniture COMPLETE! Here are the finished photos! The paint went on evenly and smoothly with no dripping. When I use a brush I swear I ALWAYS have drips! 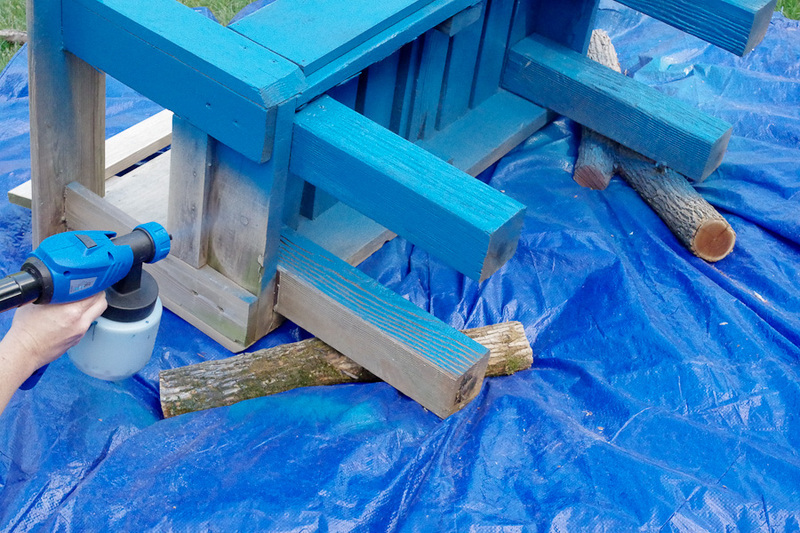 As you can see, I had so much fun that I threw my daughters little wooden picnic table into the mix and sprayed it too! 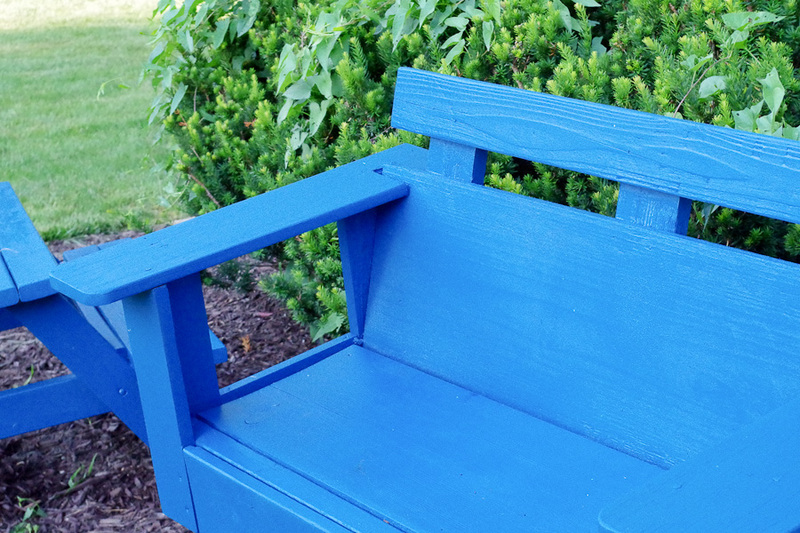 I love the way my bright blue furniture looks out in our yard. 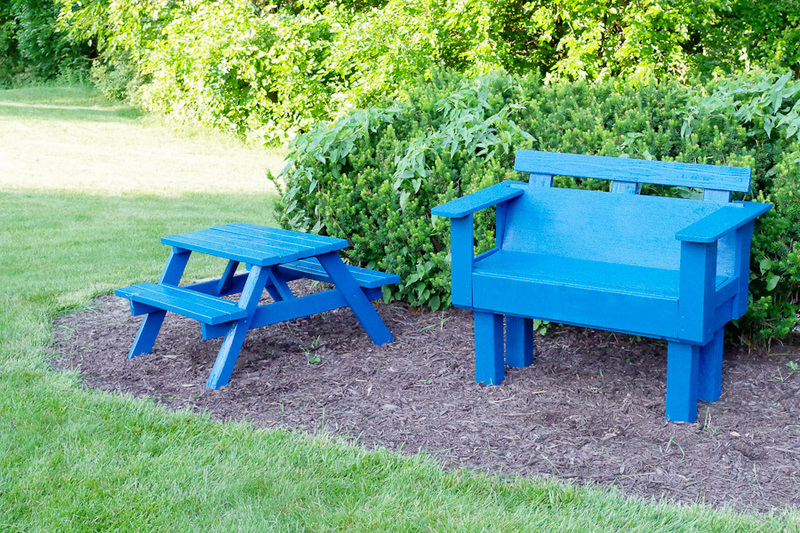 It’s the perfect spot for my kids to take a rest while they are running around or playing with their friends.